Thanks to the prevailing ceasefire the people of the south can once again visit the ancient Buddhist shrines in the north of Trincomalee where there is ample evidence of the existence of thriving Buddhist communities in the Anuradhapura period of our colourful history. Among these shrines one of the most beautiful is the Vatadage at Tiriyay  village some 80 kms north of Trincomalee. It is about 12 kms from the Kuchchaveli rest-house. The pictures accompanying this article were taken by a visitor to the area during the Easter holidays. When I saw them I breathed a prayer of thankfulness that this national treasure had escaped the wrath of extremist vandals. It is our bounden duty to ensure that these priceless shrines are preserved for posterity. The Vatadage at Tiriyay stands on a hill 280 feet tall overlooking the estuary of the Yan Oya. From this height it commands a stunning view of the surrounding countryside. To the east lies the broad sweep of the ocean sometimes hidden in coves of great beauty among them being Pirates Cove where the waves break gently on miles of sandy beaches. Elsewhere, is layer upon layer of jungle extending towards the faint line of mountains far away. Only a true artist and a lover of nature could have selected a site of such breathtaking beauty to honour the Blessed One. I first visited Tiriyay in 1974 with a group of pilgrims on a crimson evening of a Poya day. As we turned, in a corner of the jungle road we saw the Vatadage atop a hill silhouetted in the evening light thrusting its majestic pillars into the riotous sky almost in a gesture of prayer. An indescribable feeling of pride and reverence overwhelmed me and the other pilgrims as we stood enthralled by the beauty of the spectacle above us. Having climbed the 280 easy steps to the summit we tarried awhile in the gathering dusk until the great poya moon rose over the sea and clothed the shrine in a sheen of silver. In that silence around us we thought we heard the soft tread of devout feet as the monks of old forgathered for their evening prayer. "The cave of the daughter of the Chief Uttiya; And the cave of Pigala Anudi are given to the Sangha of the four quarters"
According to archaeologists and historians, these early Brahmi inscriptions are usually found on the brow of caves below the drip ledge. This is so at Tiriyay too. These one line inscriptions are a characteristic of the period between the 3rd century BC and the second century AD. The summit of the hill (about one acre in extent) had been levelled to build a dagaba. In the eighth century the dagaba had been enlarged and encircle by a Vatadage. Around the dagaba are two concentric rows of pillars of exquisite design. There are thirty two pillars on the perimeter and sixteen in the inner circle. On the edge of the platform which drops sharply into the plain is a stone screen wall about six feet in height. Four flights of steps from the four directions lead to the dagaba. On the eastern side the flight of steps ends in the neighbouring hill which is said to contain the ruins of monastery buildings. Stone statues of the Buddha lay on the ground fallen from their stone pedestals. The well preserved guard stones have a character of their own. 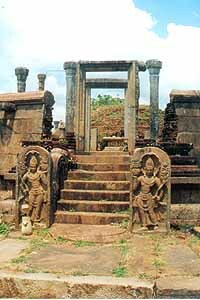 According to the Archeological Department the guardstones at Tiriyay appear to belong to a phase earlier than those found near the Thuparama and the Ratmalprasada at Anuradhapura. Moonstones, Makara balustrades, flower altars and the naga guard stones are works of exquisite beauty. Workmanship everywhere is of an extremely high order in keeping with the genius and artistry of our gifted ancestors. A long sanskrit inscription on a rock boulder states that this shrine was founded by a company of merchants led by Tapassu and Balluka. They were the two merchants who had the privilege of offering the Buddha the first meal after the attainment of Supreme Wisdom. They had received from the Blessed one some strands of hair from his own head as an object of worship. According to the Pujavaliya the two merchants carried the hair relic in a casket wherever they went on their trading voyages. On one occasion they landed on the north east coast of Sri Lanka somewhere near the Yan Oya estuary. They had gone in search of firewood to cook a meal having placed the relic casket on a rock where it would be safe and secure. After partaking of the meal they went to collect the relic casket so they could take it back to their vessel and proceed on their voyage. But a miracle had taken place. However much they tried the relic casket could not be moved from the rock on which they had placed it. Convinced that this was a holy place the merchants built a cairn around the casket and went away. The Archaelogical Department is of the view that the scene of this miraculous happening had the name of Girihandu which is identical with Girikandi of the Tiriyay sanskrit inscription. It is reported that as the years went by the Buddhists in the surrounding areas came in large numbers to this site on pilgrimage. From these humble but hallowed beginnings the shrine had been enlarged and improved from time to time and by the eighth century it was a handsome edifice towering over the surrounding plain and attracting many pilgrims from all parts of the country. There is no doubt that the area surrounding this sacred shrine was once inhabited by a thriving Buddhist community who maintained this and other places of worship in the vicinity. This view is amply supported by the fact that no less than sixteen places of Buddhist worship have been found in and around the Nilaveli-Kuchchaveli area. The findings at Kuchaveli in the seventies and the collection of parts of Buddha statues in the unpretentious archeological office in Kuchchaveli (I do not know whether it is there now) provides incontrovertible evidence of the predominating influence of Buddhism on these areas in the early years of the Christian era. These beloved shrines had been abandoned under the relentless pressure of invasions from the north and by the eleventh century had gone into decay. Not only archaeologists and historians but all lovers of our rich religious and cultural heritage should visit these long forgotten places which have managed to survive the ravages of time and man. They will not fail to return with hearts full of reverence and admiration for the work of our forefathers, their meticulous attention to detail, and the soul stirring refinement that governed their every action to honour the Blessed one. Perhaps after long years of abandonment and conflict during which time these shrines were lost to us we should value them now more than ever before. It is my sincere hope that with the plans for the development of the war ravaged areas the Archeological Department will be provided with the necessary funds to undertake a crash programme to rehabilitate these sacred shrines which are so dear to our hearts. I also sincerely hope that more and more people from the south will visit these hallowed places and help in their restoration. After all they are an integral part of the very soul of Sri Lanka.